Initially two private sessions are scheduled, each lasting an hour. The first is called an Initial Assessment where a full medical history is taken and an assessment made of your movement ability and posture. We will discuss any personal goals that you desire from your Pilates programme. In the second private session you will be guided through your personalised programme. 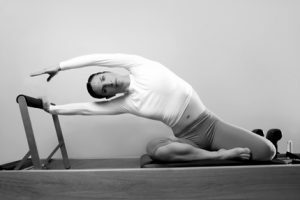 The unique techniques and philosophies will be introduced to you as well as being instructed on the safety and correct use of the specialised Pilates equipment. In addition to this, you will be also given a homework sheet which is a series of mat and stretching exercises so you can continue the mind/body awareness at home. After these two private sessions, you then have the option to continue with private workouts or go to semi private lessons which are a ratio of up to 4 clients to 1 instructor for a one hour workout. Various Pilates equipment is used throughout Studio sessions. These include the Universal Reformer, Trapeze Table, Wunda Chair, Spine Corrector, Swiss Balls, Foam Rollers, Magic Circles, Chi Balls, Franklin balls, Therabands, Ankle Weights and Arm Weights. Mat classes are for the absolute beginner to the experienced. They will improve your strength, posture and mobility. The maximum number of participants in each class is ten. Everyone performs the same exercises on a mat on the floor together with the instructor. We offer Beginner, Intermediate/ Small Apparatus Classes as well as a Stretch and Roll Class. introduce you to the Pilates method. focus on teaching you the breath and alignment in a slower paced class. teach you the preparation to many of the traditional mat exercises. due to the slower pace, it will allow for correct technique and alternative exercises to be taught. For those who have practiced Pilates before and those who have attended 10 or more classes recently. We take the exercises up a notch to challenge you and mix things up by using some Small Pilates apparatus for variety and additional challenges. This includes Swiss Balls, Magic Circles, Foam Rollers and Therabands. This class will focus specifically on improving your muscle flexibility and working the tension out of your body. The exercises aid in circulating blood and lymphatic flow as well as improving your stretch reflex. Overall you will feel better, lighter and more bendy! The Buff Bones exercise system is based on a research-supported design and combines Pilates, strength training, functional movement and therapeutic exercise. It uses techniques to align the joints, enhance the posture and balance and prepare the body for optimal loading of the bones, which is how they strengthen. It is a safe option for people with osteoporosis and arthritis. It is an award winning and medically endorsed programme.